Star Wars Bookends: Darth Vader and Stormtrooper | Nerd Much? With the latest release to the Star Wars franchise, Solo: A Star Wars Story, there has definitely been a noticeable uptick in available Star Wars merchandise. Lucky for you, we are here to weed through the good and bad and bring you the true gems of the cool stuff universe. We have truly done it this time, with a solution to a common conundrum that truly embodies class, sophistication and nerd all at once with these Star Wars bookends. Do your books keep falling off the shelf? Don’t you wish you could use the force to keep them in their place? Well now you don’t even need to, let these badass Star Wars Tales of the Dark Side Darth Vader and Stormtrooper bookends do the work for you. These ceramic bookends are perfectly designed to replicate that iconic look of the galactic empire, while still being incredibly functional. Each set of bookends come with both a stormtrooper helmet as well as Darth Vader’s. Feel like splurging? Order 2 sets and have coordinating shelves. Class up your bookcase or dvd shelf with these iconic officially licensed Star Wars bookends, they are sure to look great in any room. These ceramic bookends measure 30 cm (w) x 19 cm (h) x 19.5 cm (d) and are sure to add just the right amount of Galactic style to your décor. Don’t forget Father’s Day is just around the corner, give your dad the perfect gift to nerd up his office or library, after all he probably introduced to you to the Galactic Empire anyway. Currently coming in at $40.99 at Merchoid, Order yours now. There is a very limited stock available (just five left at the time of this writing). Have these helmet bookends made you realize how badly you need a functioning and wearable Darth Vader helmet? Check out the Star Wars The Black Series Premium Darth Vader helmet here. 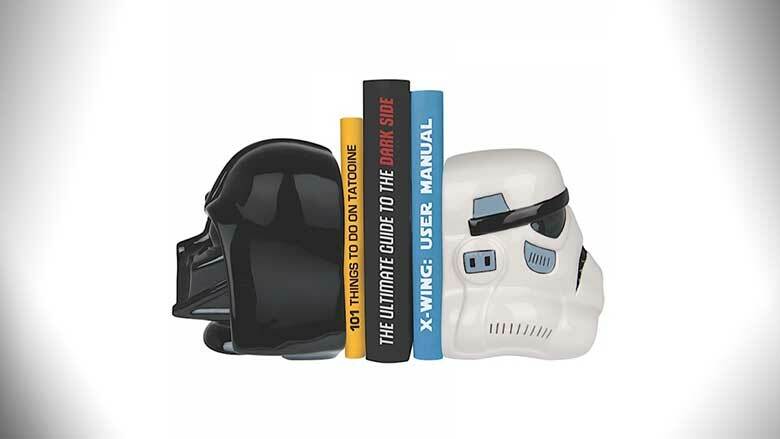 Buy these Star Wars Bookends at Merchoid here.